I am a big fan of the decorative colors and patterns from the Arts and Crafts period - swirling vines and twisting leaves of sage green and prussian blue, stylized flowers, birds, and fruits. So when Vienna's Museum of Applied Arts - the MAK - opened an exhibit on English textiles from the period, it was only a matter of time before I was there. The exhibit is down in the MAK's basement, where the pieces are protected by glass and low light. The rows of fabric panels are breathtaking. Each piece hypnotizing. What an extensive variety of English textiles the MAK has collected! Most of the pieces were acquired during the very period in which they were produced, the late 19th century. Back then the MAK was called the Imperial Royal Austrian Museum of Art and Industry (or die k. k. Österreichischen Museums für Kunst und Industrie). The MAK's textile exhibit is open until October 13, 2013. If you love textiles and are in Vienna this year, I encourage you to visit the MAK. I'm still not over a holiday-induced sweet tooth. I still crave those ginger cookies and chocolate bundt cakes we baked way back in December. So, how do I satisfy my cravings in a healthy way? What about a sweet salad with baby greens? I must admit that it took me some time to get used to brown rice. But once I started to add it to dishes, I begin to notice how the chewy texture and nutty flavor enhance a meal. And since it takes my body longer to digest brown rice, I find I am not as hungry later in the day. For the sweet elements of this salad I choose a tropical trail mix - macadamia nuts, cashews, almonds, dried pineapple and cranberries. I also added balsamic cream, which is a wonderfully sweet reduction, often used in salads as well as chicken and fish dishes. Layer ingredients in a shallow bowl in the order listed above. Drizzle on the olive oil and balsamic cream. Add salt and pepper to taste. I hope you enjoy this and my other recipes. Stay healthy, ya'll! Easter is coming. This is a traditional time for one of my favorite things... baskets! I spend a lot of time looking at these lovely woven works. What captivates me? Color, shape, texture? Maybe it's the utility of a basket that draws me to it. 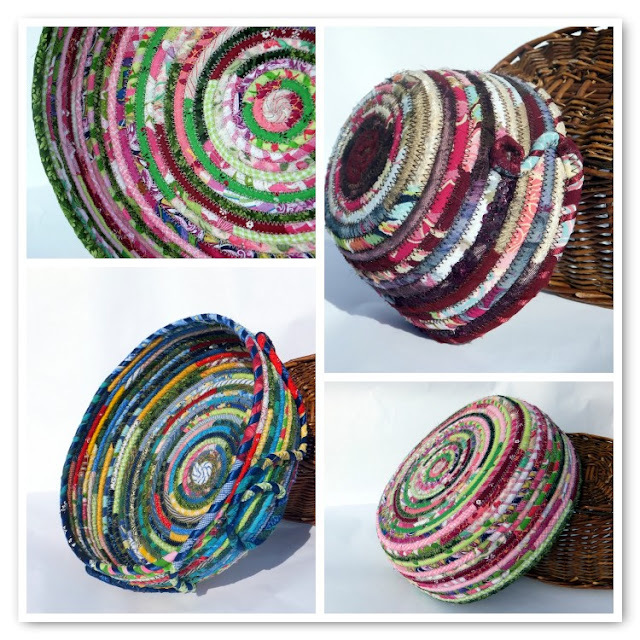 After all, baskets are relatively light and they can hold lots of stuff! 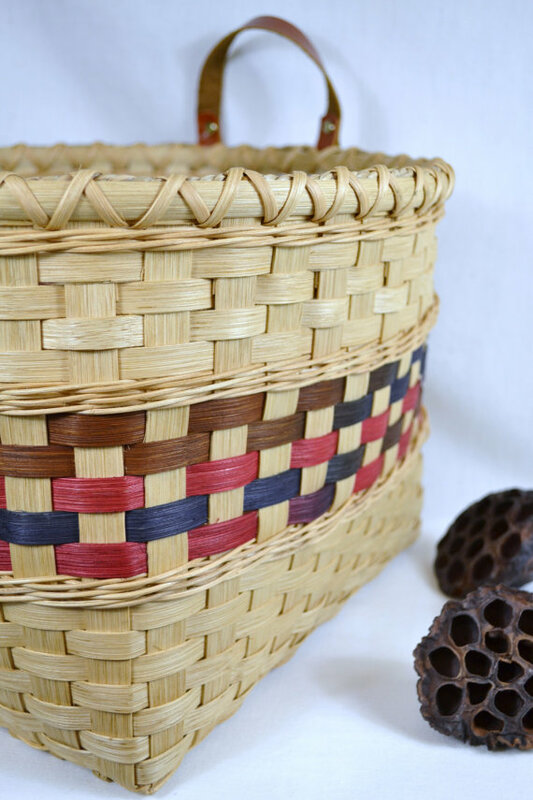 Traditionally, baskets were made of natural fibers - willow, pine needles, and reed, for example. Many crafters still use traditional materials and methods. Becky Bechtel of BrightExpectations makes beautiful baskets following this style. 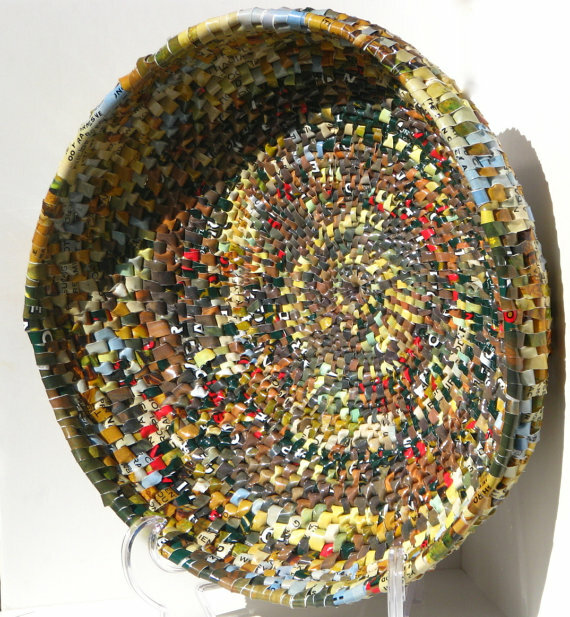 Today basket makers have added non-traditional materials to the mix - wire, plastic bags, and magazines, for instance. Check these lovelies out. How about a basket made of recycled plastic bags? 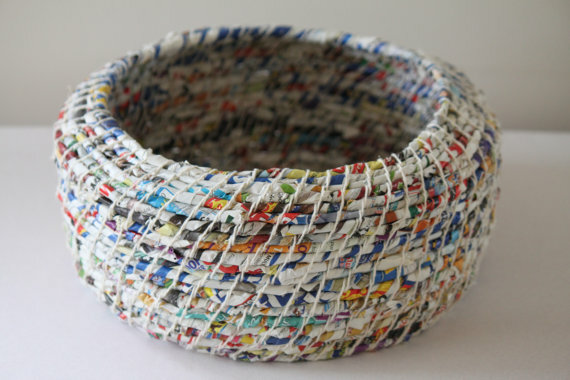 Here's a cool basket made from junk mail. 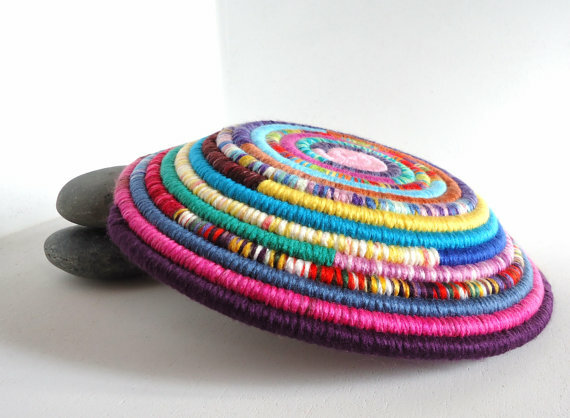 I love the fun colors in this yarn basket. Womeldorff, Sara. 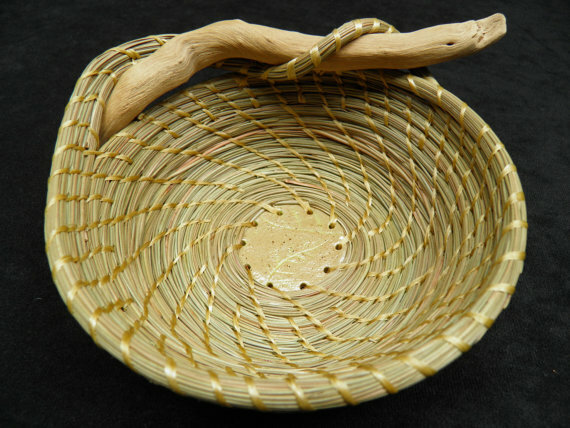 “Basket Weaving: Old Tradition to New Art Form.” The University of Arizona, n.d.
During my time overseas, I’ve had the good fortune to meet talented artists and crafters from all over the world. While in Bucharest, Romania I met creative and gracious Adity Chakravarti. Adity has lived - and created - all over the world, accompanying her husband, a diplomat in the Indian Foreign Service. I recently caught up with Adity, who is now living in Dublin. May I introduce you to the world and work of this inspiring artist? You have traveled and lived in many places on this planet – China, Switzerland, Bangladesh, Canada, Tanzania, Romania, and now Ireland. How has this transient life impacted your artistic expression? I am an inquisitive person by nature. I tend to get ecstatic over little things that I see - a pebble on soil, a drop on a leaf, the angle of a face in the right light. So when I move to a new place I like to get out and absorb the sounds and sights around me - then after it has got stored somewhere inside my brain I get an urge to reproduce it in my paintings (or more recently to write about it). In Canada it was the flaming red of maple leaves against a cobalt blue of the sky that got me painting on burnt wood from my fireplace. In Tanzania, I found I was painting images with the orange-brown of the African soil, the lush green of the vegetation, the ebony of the African skin and the brilliant patterns of the garment called 'kanga'. In Romania it was impressions of churches, arches, angels and monks in the colors of Maramures in autumn. The visuals have changed each time I have moved with the constant being my medium of acrylic on burnt wood and gouache on paper. What person or place has influenced your art the most? If you could spend time with a contemporary artist or creative person, who would it be? It would be a miniature painter from Jaipur. I could spend hours watching him (they are usually male painters - the Rajasthani women do exquisite traditional embroidery) move his very fine brush with natural colors over a face, building layers to give depth and contour and then make intricate folds of patterned fabric. I find it mesmerizing. I met one of them Shri Janki Das in Jaipur - he was a simple man and worked out of his tiny, humble home in the middle of a busy bazaar. He had his little desk and a lamp and his paints next to him on a mat on the floor. So no studio, no fuss about privacy and happy to have me (or anyone else) by his side, watching. You have worked with a variety of media – wood, canvas, gold foil, clay, acrylics, gouache. Do you have a favorite medium, one you seem to always return to? I keep going back to burnt wood. I am fascinated by the fact that wood can be carved, burnt, darkened and it exists everywhere. I love the texture it provides. It is wonderful to run your hands over it and feel the very natural medium. I also like to remember the fact that everything in life is transient. And since wood is burnt everywhere - it is a reminder of this simple fact. You recently moved to Dublin. What do you like most about the city? I like Dublin (and Ireland) for two reasons. One, its people - they are kind and very friendly. I went to a big supermarket soon after I arrived in Dublin. I was looking for disposable cups. I found a salesman and asked him. He led me to the cups, was apologetic about the slightly high prices and guided me to the cheapest similar product! I have not seen that happening anywhere else. And two, its proximity to natural beauty. The Wicklow mountains are just 15 minutes from south Dublin. There you have sweeps of moors, mountains dotted with lakes and the incredible bogs. It is breathtakingly beautiful. What three things do you miss most about India? I miss the warmth of family and stimulation that I get from the almost constant, chaotic movement of such a variety of people as in India. I also miss the cheap street markets and food . And also the presence of beautiful, affordable craft everywhere. What are some of your favorite things to do in Dublin? Any special spot you would like to share? I like wandering its streets and stare at beautiful homes and catch glimpses of life going on inside them. I also love to go to Glenmacnass Valley in the Wicklow mountains. It is a desolate, isolated stretch of wild bog land. In the past I had only vaguely read about bogs but did not quite know what it was actually like. It is an incredible scenery - just clumps of low grass and heather bushes - almost miles of it. I sit there by the roadside or in the car, depending on how windy it is (and it can be terribly windy!) and just look. Up there I feel as though I am the only person on this earth and my mind stays strangely empty. I can't wait to see what Adity will paint next. Wicklow mountain landscapes? Whatever she creates, I know it will be beautiful. That's the world of Adity. To learn more about Adity Chakravarti and to see more of her lovely pieces, visit her at Something Special. To read about other inspiring artists, click here.